Dr. Pamela A. Barkett grew up in Los Angeles, California and is a 1986 graduate of the University of Southern California School of Dentistry. She moved back to Youngstown, Ohio in 1988 and opened her practice in Canfield, Ohio. She takes pride in focusing on family and cosmetic dentistry. Dr. Barkett has been serving as an adjunct professor for the Dental Hygiene Program at Youngstown State University since 2009. Currently, Dr. Barkett is a member of Corydon Palmer Dental Society, Ohio Dental Association, and the American Dental Association. She is also actively involved in the Canfield community. Dr. Barkett has been married for 28 years and has three beautiful children. 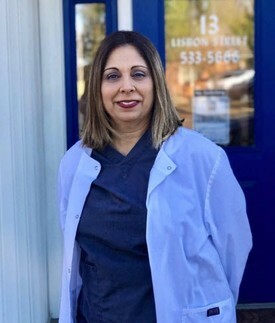 Although she grew up in California, her family was from the Youngstown area and she chose to start her practice here in a smaller community setting while still serving a tri-county area. She is very passionate about her work and patients and has loved providing confident smiles for this community throughout the years.